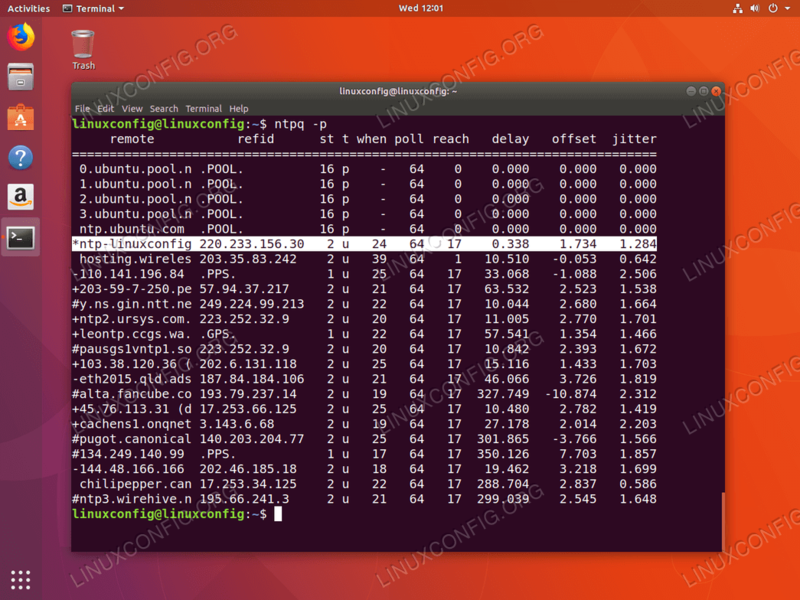 Privileged access to your Ubuntu System as root or via sudo command is required. The NTP server comes pre-configured by default. However, we may want to switch to the NTP server pool close to our server location. In order to configure your NTP server with a new NTP server pool you should have at least one NTP server. The recommended amount is 3 - 4. In case you do not have enough NTP servers for your country, add the continent NTP servers to the list. If you wish to make your firewall rules more strict visit our How to Open/Allow incoming firewall port guide for more information. With the timesyncd disabled we will now install NTP daemon and set our own configured NTP server as preferred NTP server for the time synchronization. Next, configure NTP daemon to use our previously configured NTP server resolved via the ntp-linuxconfig host name. $ sudo bash -c "echo server ntp-linuxconfig prefer iburst >> /etc/ntp.conf"
The * sign indicates that our NTP server ntp-linuxconfig is selected as the current time synchronization source. Read the below appendix for more information on how to interpret the ntpq command's output. refid - The upstream stratum to the remote server. For stratum 1 servers, this will be the stratum 0 source. st - The stratum level, 0 through 16.
when - The last time when the server was queried for the time. Default is seconds, or "m" will be displayed for minutes, "h" for hours and "d" for days. poll - How often the server is queried for the time, with a minimum of 16 seconds to a maximum of 36 hours. It's also displayed as a value from a power of two. Typically, it's between 64 seconds and 1024 seconds. reach - This is an 8-bit left shift octal value that shows the success and failure rate of communicating with the remote server. Success means the bit is set, failure means the bit is not set. 377 is the highest value. delay - This value is displayed in milliseconds, and shows the round trip time (RTT) of your computer communicating with the remote server. offset - This value is displayed in milliseconds, using root mean squares, and shows how far off your clock is from the reported time the server gave you. It can be positive or negative. jitter - This number is an absolute value in milliseconds, showing the root mean squared deviation of your offsets.
" " Discarded as not valid. Could be that you cannot communicate with the remote machine (it's not online), this time source is a ".LOCL." refid time source, it's a high stratum server, or the remote server is using this computer as an NTP server. x Discarded by the intersection algorithm.
. Discarded by table overflow (not used). - Discarded by the cluster algorithm. + Included in the combine algorithm. This is a good candidate if the current server we are synchronizing with is discarded for any reason. # Good remote server to be used as an alternative backup. This is only shown if you have more than 10 remote servers. o Pulse per second (PPS) peer. This is generally used with GPS time sources, although any time source delivering a PPS will do. This tally code and the previous tally code "*" will not be displayed simultaneously.